Bugatti will reveal new special edition model later this year. 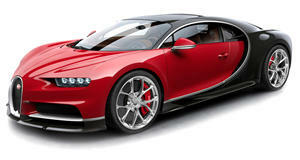 At this year’s Geneva Motor Show, Bugatti unveiled the . A true Chiron successor will eventually arrive, but in the meantime new CEO Stephen Winkelmann has hinted that , marking the first time the automaker has developed more than one model at a time. Bugatti hasn't revealed what these models will be, but one of them was recently previewed at a private event in Los Angeles. Bugatti confirmed that the event in Beverly Hills was a customer dinner to present the new Chiron Sport. However, YouTube channel Whitesse JR was at the event and attended a presentation where a new top-secret Bugatti model was also revealed. Unfortunately, a non-disclosure agreement prevented the YouTuber from spilling any details. He did, however, say that “It is going to be a very controversial car,” while also adding it will be just as powerful as the mighty Chiron and have a limited production run. But what could it be? It's too early for a Chiron successor since the hypercar has only been around for two years and is still in production. A Super Sport version is also unlikely to have been unveiled so soon after the Chiron Sport. Bugatti has previously said it isn’t keen on adding hybrid technology to the Chiron, though its eventual successor will likely adopt a hybrid powertrain. Could Bugatti’s new mystery model be a four-door sedan? Back in 2009, the autoamker unveiled the four-door Galibier concept. Winkelmann has already said he’s keen to put a Bugatti sedan into production, and the CEO usually doesn’t waste any time putting plans into action. Winkelmann was also responsible for the Urus at Lamborghini and suggested expanding its line-up with a four-door model. However, while a sedan could one day arrive, this isn't what was shown to a select few prospective clients last week. A source who saw the new model reached out to provide just a handful of details. And as Whitesse Jr. says in his video, it's certainly going to be controversial. Based on the Chiron, the limited-edition model will have styling inspired by the Vision GT, with the only design similarities being the distinctive C line on the side of the car and a horseshoe grille on the front. It will also cost in the region of $7 million when loaded with options. The Vision Gran Turismo was a one-off concept that was . No doubt Bugatti had a few calls from its wealthy client base asking if they could create a few more models. This limited edition model appears to be the answer to their demands.